VeloPress is pleased to announce the release of the North American edition of Slaying the Badger from award-winning author Richard Moore. This highly acclaimed book is now available in the U.S. and Canada in bookstores, bike shops, and online. For a preview and sample first chapter, please visit www.slayingthebadger.com. It's the 1986 Tour de France and the battle lines are drawn. America's hope, Greg LeMond, fights to dethrone "the Badger," French hero Bernard Hinault. Former world champion LeMond is gunning for his first Tour victory. Hinault is clawing his way toward a record-breaking sixth. LeMond, mercurial and raw, struggles for recognition. Hinault, fiercely combative and relentlessly aggressive, wants to go out on top. On his side, LeMond has two team allies. But Hinault has five. And there's one other problem: They're on the same team. LeMond and Hinault's explosive rivalry burned the rule book, shredded friendships, shattered careers, and destroyed convention. It also led to the greatest Tour de France ever raced, an epic, chaotic, confounding, and ultimately exhilarating war of pure adrenaline, cold-blooded calculation, and extraordinary athleticism. Heroism, treachery, spectacle, controversy, betrayal: In detail and emotion, award-winning author Richard Moore traces each storyline to its source through innumerable interviews-not only with LeMond and Hinault in their own homes but also with teammates, rivals, race directors, journalists, sponsors, and promoters. Told from these many perspectives, the alliances, tirades, and broken promises divulged in Slaying the Badger build to the stunning climax of the 1986 Tour de France. 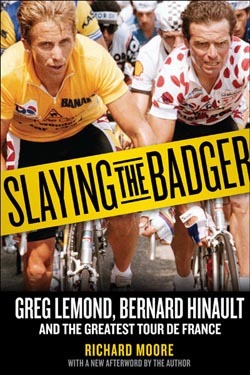 Slaying the Badger is an incomparably detailed and highly revealing tale of cycling's most extraordinary rivalry. Richard Moore is a freelance journalist and author. His first book, In Search of Robert Millar, won Best Biography at the 2008 British Sports Book Awards. His second book, Heroes, Villains & Velodromes, was nominated for the William Hill Sports Book of the Year. He writes on cycling and sport and is a regular contributor to the Guardian, Sky Sports, and The Scotsman. Moore is a former bike racer who represented Scotland at the 1998 Commonwealth Games. Learn more at www.richardmoore.co.